Recently, the Cambodian Ministry of Education Youths and Sports has been trying to promote the critical thinking, problem solving and creativity skills within secondary school students (more info). At PEPY, we help students develop these skills through providing access to technologies and encouraging independent exploration. 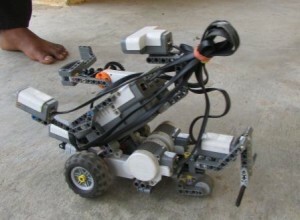 Students in the Chanleas Dai junior high school use the Lego Min-Storm during their free time to build up their skills.